This is the second edition of a map published seven times until 1806. The title is embellished with an engraving of Father Thames, with St Paul's visible in the distance to one side of him. This edition includes an inset plan of the proposed Wet Docks. 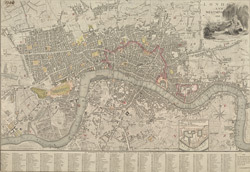 In 1796, the year this map was published, a Parliamentary Committee attempted to resolve the docking problems such as congestion, delays, lack of warehouse space and theft. The result was a number of project proposals for the building of new docks. However, none of these proposals were carried out, and the problem was not solved until private companies began building enclosed docks in 1802.